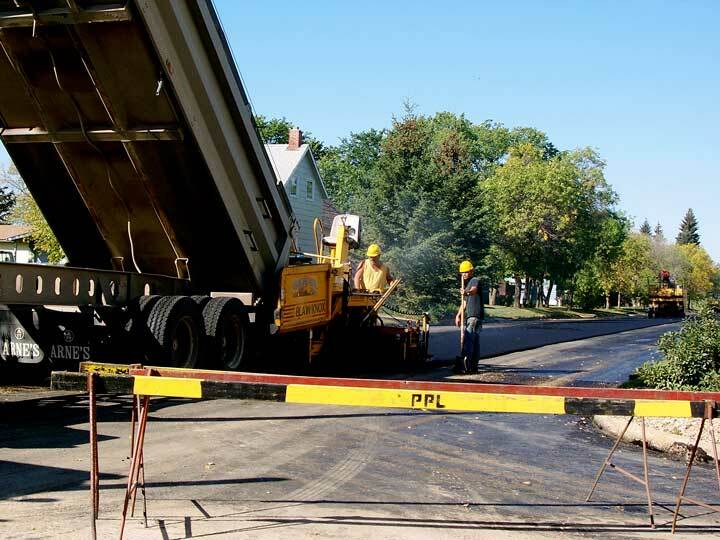 Though some patching has been going on this year's street repair projects have concentrated on several blocks of complete refurbishing. 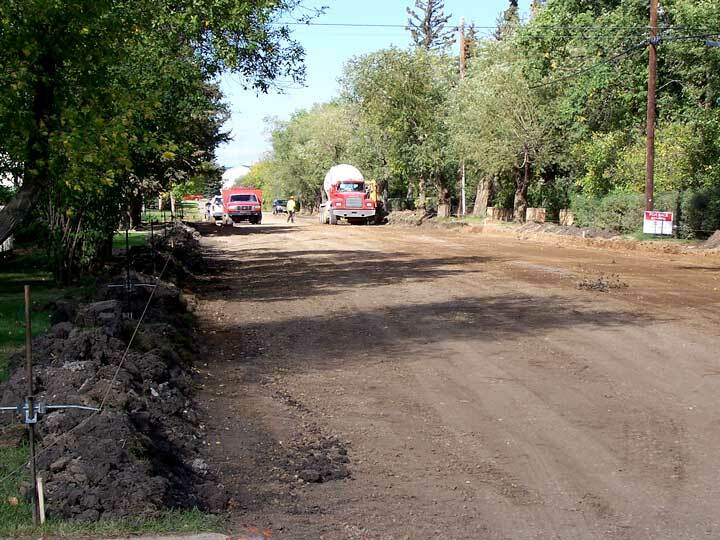 The block in front of the Maple Ridge Condo was one of the few that will be just resurfaced the old highway (below) and the street to the hospital (right) are both getting a major make over. The scene right and below were photographed last Tuesday as one was being excavated and filled and the other is being readied for the installation of new curbing. This is how the street to the hospital looked after 3:00 Tuesday afternoon as the new fill is being packed into place while below the old material is being removed and a series of dump trucks were moving it to the new cul-de-sac where the lots are below an acceptable grade for flooding and drainage. 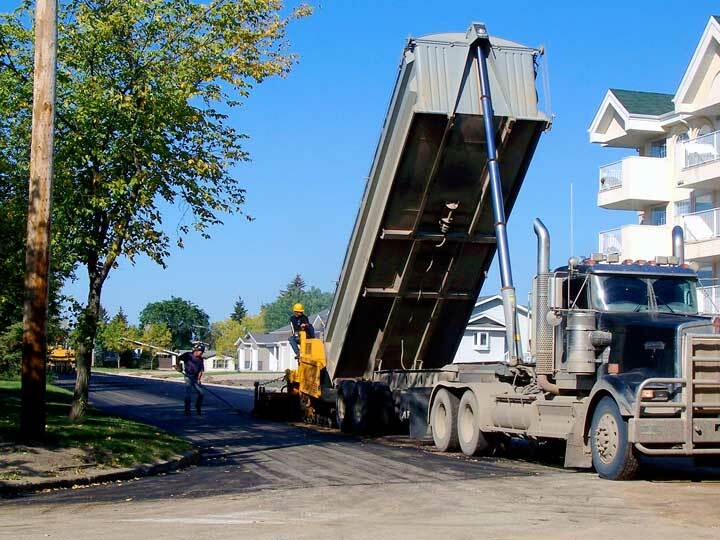 This kind of heavy work takes time and the town has devoted all of its work crew's attention to participation in the street upgrade with the accompanying engineers and workers with Paramount Paving of Saskatoon carrying out their part of the project. 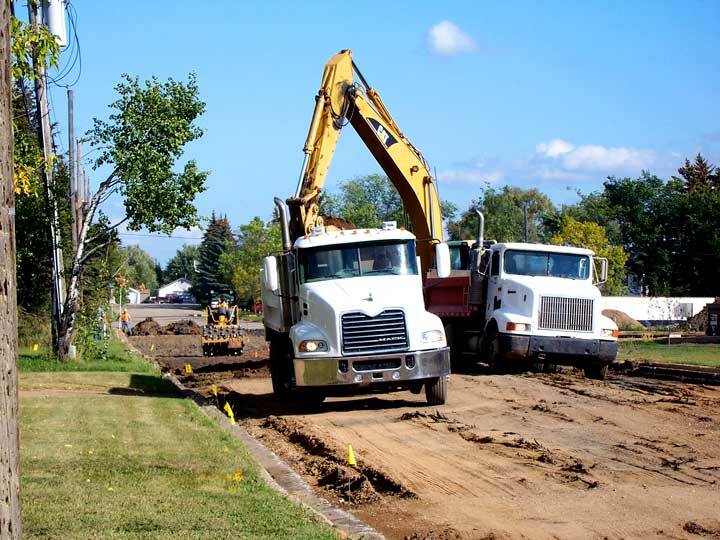 In this picture (right) Chupa Excavation and Triucking dump truck is delivering the removed roadway to the very low area on the north side of the new cul-de-sac while the rarely used town grader is busy smoothing out the loads. 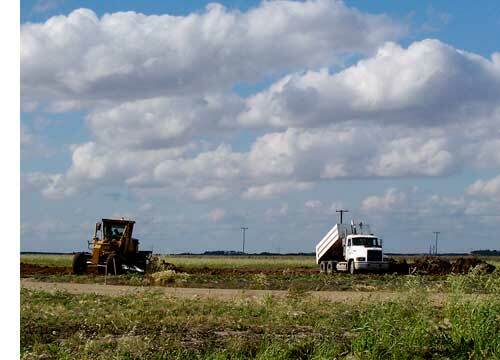 Since a major portion of this fill is gravel it will form an outstanding base for these new lots as they are being raised almost three feet in some areas. 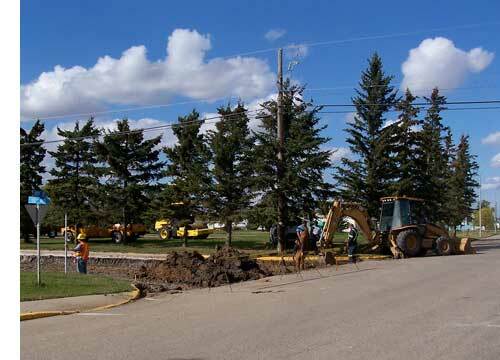 The picture below was taken at 10:00 Wednesday morning with the new curbs in place and the paving crew sorting out driveways. 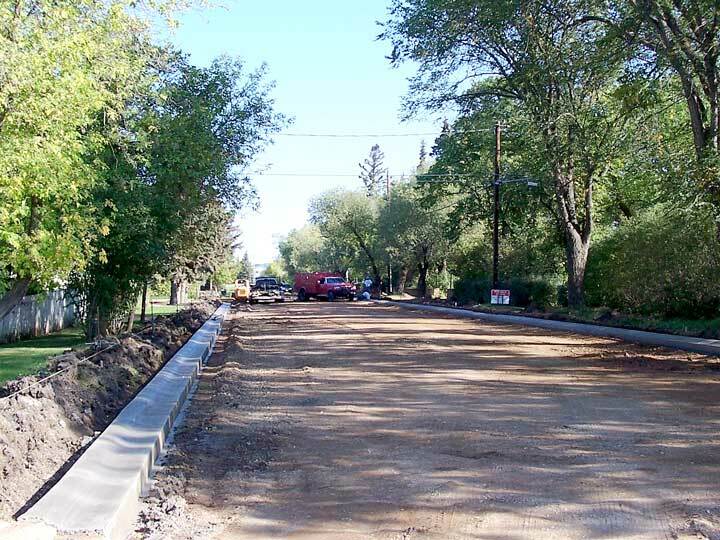 This is the hospital road at the same time, just after ten as the new gravel to top off the roadway and provide the surafce on which to lay the pavement. 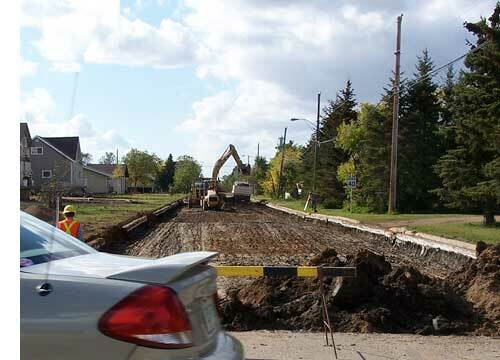 Today the new curbing was being run along the south side of this street with the paving process no ongoing over on the old highway. 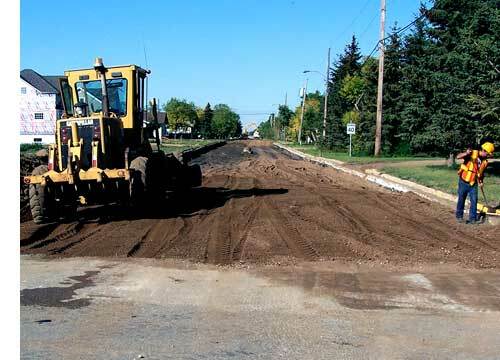 There is no question about the need for this major overhaul of these two streets but there are still so many areas of the town's streets brutally damaged from water main repairs that the neglect exceeds the budget available.